IMPACT! 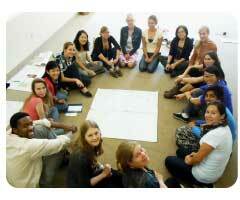 #Sustainability Champions Training for students is coming to #Edmonton http://bit.ly/HE3SAB Apply today! A student between the ages of 19 and 25? OR an IMPACT! Alumni? Then you are invited to apply to be part of the IMPACT! Sustainability Champions Training in Edmonton on June 21-22, 2012. The Co-operators and The Natural Step Canada are partnering to offer you the IMPACT! Sustainability Champions Training, a series of two-day trainings offered across Canada, focused in two areas: realizing your leadership potential and developing your sustainability project using the The Natural Step Framework for Strategic Sustainable Development. After the training, you’ll be partnered with a sustainability professional for four months of personal mentorship. To ensure a quality learning environment, participation is limited to 30 spaces in each city. The participant cost is only a $50 commitment fee and entrance fee bursaries are available based on need. All participants are responsible for their own travel and accommodation arrangements and costs. To ensure a quality learning environment, participation is limited to 30 spaces. So don’t delay, apply today! The deadline for Edmonton applications is May 31, 2012. For more information or for the French version of this release, please visit IMPACT! Sustainability Champions Training Program for Emerging Leaders (Edmonton, AB).